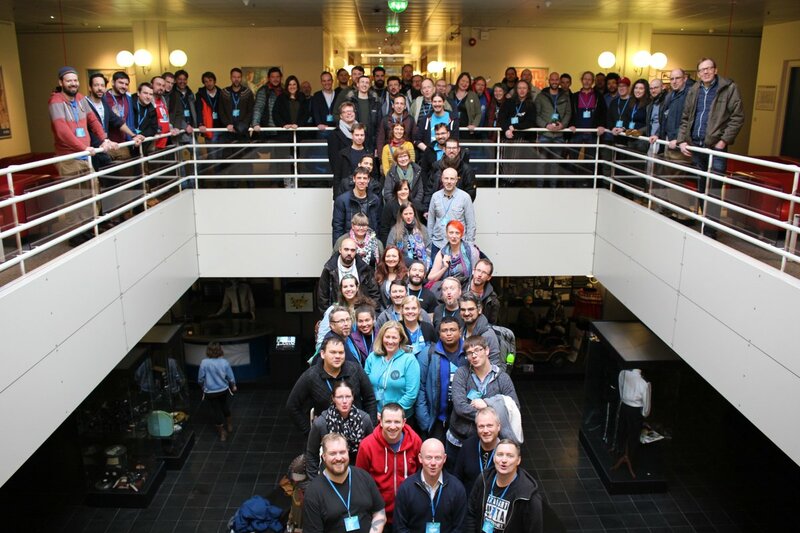 DrupalCamp Northern Lights: The time I went to Iceland and it snowed a lot. I trudged though 51cm (20.07 inches) of snowfall to make it to Sunday sessions of Iceland’s first ever DrupalCamp Northern Lights (#DCNLights). I had to walk down the middle of the not yet plowed Reykjavik streets, still dark at 8:00am, beside cars covered in the most snowfall in a single night since 1937. I was the first to the venue and was glad for that fact. It gave me time to dry my socks in the restroom without witnesses. Baddy, our organizer, soon arrived. She said we were going to plan Z and if that failed we should not worry since the Icelandic alphabet has 3 additional letters than English, Þ, Æ, and Ö. Hold on. Let’s back up a few steps. I was really excited to have my talk “We are making all of this up: Improv lessons for the developer” accepted to this camp. This was out of the normal regions where I had been focusing on session submissions and I was pleasantly surprised I was accepted, especially after seeing the caliber of the other speakers on the schedule. I am very grateful to my company for giving me the chance to attend and develop myself. I have been to Iceland once before so, this was not intended to be a sightseeing vacation, but instead a chance to learn what the European Drupal world has been up to. What transpired truly transcended either of these goals making #DCNLights a unique experience which I can only really described as a real adventure! Iceland is an 8 hour ride from my home in San Francisco and an 8 hour time difference. Taking off Thursday at noon PST put me on the ground Friday at 4:00am UTC. Keflavík airport is approximately 50 minutes from Reykjavik and all the needed transportation to the awesome Galaxy Pod Hostel meant I got to bed at about 5:45am. I was greeted with the worst weather Iceland has seen all year. This caused havoc with the initial, and most subsequent, plans. Fortunately the Icelandic way is to have backup plans to backup plans. This spirit of rolling with the punches really made this event amazing. 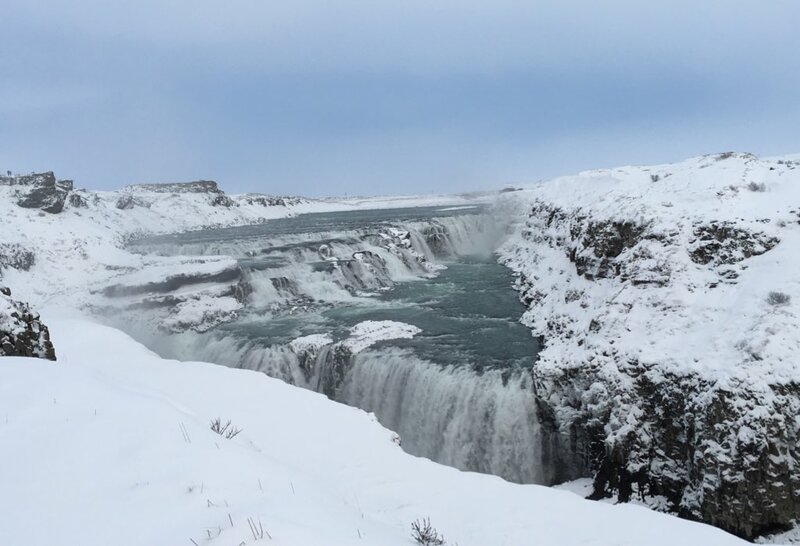 Plan A had consisted of all the speakers and attendees who could arrive on Friday to go on a Golden Circle tour, paid for by the largest organization to use Drupal in Iceland, Landsvirkjun, the national power company. We were even going to tour their completely sustainable renewable energy plant that leverages Iceland’s geothermal properties. We were to end the day with a reception thrown by the mayor of Reykjavik. However, due to the storm, this plan was scrapped by the time I was on the airplane, since the tour bus would not be able to navigate the icy roads. Plan B was to go for a city walking tour in the morning, maybe some ice skating donated by the city rink and finally the the mayors reception. The rain and wind destroyed this plan as well by the time I woke up at 9:30am. Honestly I was a bit grateful to get a few more hours of sleep. Plan C was to just meet for Ice Skating and then to the mayors. I valiantly attempted the 1km walk from my hostel to the rink but the sidewalks were a mess of ice and slush and the sleet was being whipped by the wind into my eyes, so I opted to get some work done and just go meet the mayor later. 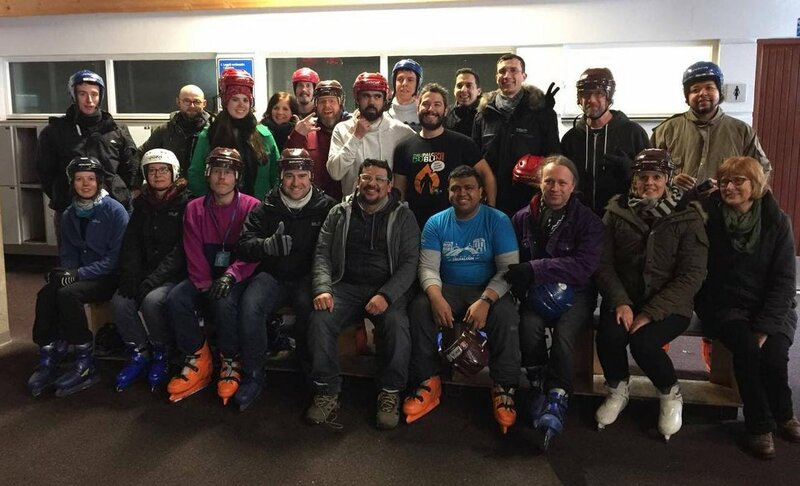 A few Drupalers did make it out and it looked like they had a stellar time. I met up with the crew who were pre-partying for the mayor at American Bar. That’s right, I flew 4,199 miles to eat ribs at a place that is specializing in my country’s cuisine. It was awesome to see familiar faces in this land of ice and snow so far from my home. I was greeted as an old friend by all the Drupalers, even ones I didn’t yet know. Plan D kicked in when we showed up to the mayors office and found that he was not able to attend due to other responsibilities. 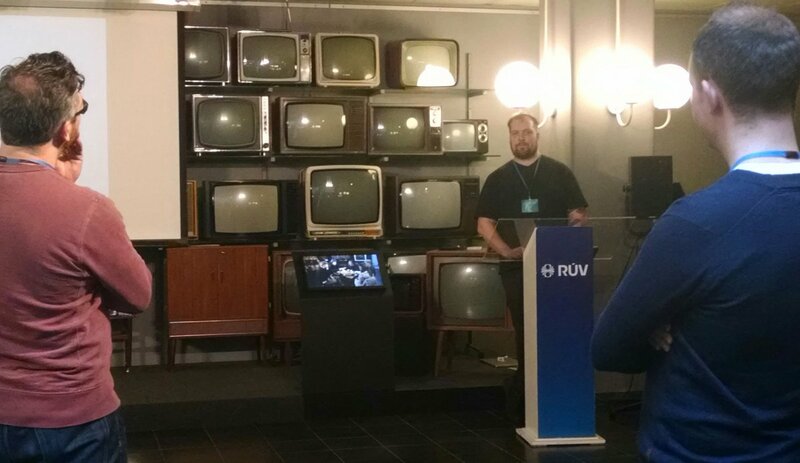 Instead he sent us a member of the Pirate Party, city council member Halldór Auðar Svansson, who gave one of the best speeches I have ever heard from outside of our community on the importance of open source. To paraphrase: “Drupal is free as in beer, which is something Icelanders like. It is good to be wise with the people’s resources. 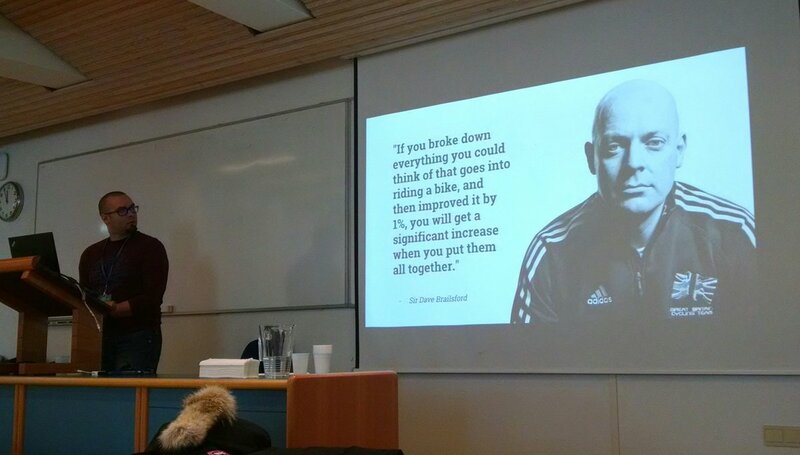 But it is also free in another way that Icelanders also feel strongly about, transparency and commitment to community’. We were given very nice beer and wine and hor d’oeuvres reflecting the local culinary pallet. Plan D also had a reserved room awaiting us in a bar atop a hotel where I learned many after parties have been thrown by the national opera and symphony, which are only a few blocks away. Aside from a helicopter ride I can’t imagine a better perspective on seeing the city lit up in the cold northern dark. The final piece of Plan D was the wonderful surprise that all the Saturday sessions had been reorganized and we were still going on the sightseeing trip, minus the power plant tour since they do not give those on the weekend. Capping the first night was a local rock band at a coffee shop and a late night hot dog with fried onions and brown mustard. If there is a better way to serve a hot dog I have not encountered it. Saturday brought a snow flurry that started as I walked from my hostel to the venue, about 3km away. It ended when I was a block from the University of Iceland’s Oddi School of Business and I was completely white from head to toe with snow. I was not the only one. Even with the slipperiness of the sidewalks and the windy route that google maps suggested I arrived just in time for the opening remarks. 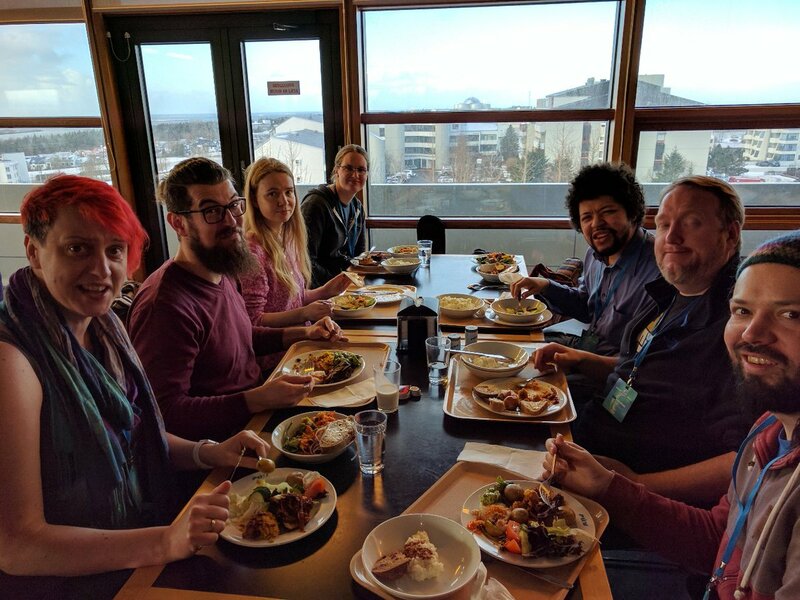 Lunch was served at the RÚV (Icelandic National Broadcast Service) cafeteria. It was a traditional preserved whitefish lunch. The Drupal Viking told us all that this exact menu was a staple on a Saturday for his entire life. More reliable than the sun coming up. We were very well fed and then got a quick tour and heard an awesome presentation (detailed below in Sessions). We then boarded 2 very large tour buses and away we went to see the continental divide, which is the original location of their parliament, Althing. An Icelandic flag marks where the Speaker of the Law would have to stand to deliver the rule to the people a millennia ago. It snowed on us the entire time we were off the bus but immediately cleared to a beautiful day as we continued on towards the geysers. We stopped for about an hour at some of the most beautiful waterfalls I have ever seen, Gullfoss. 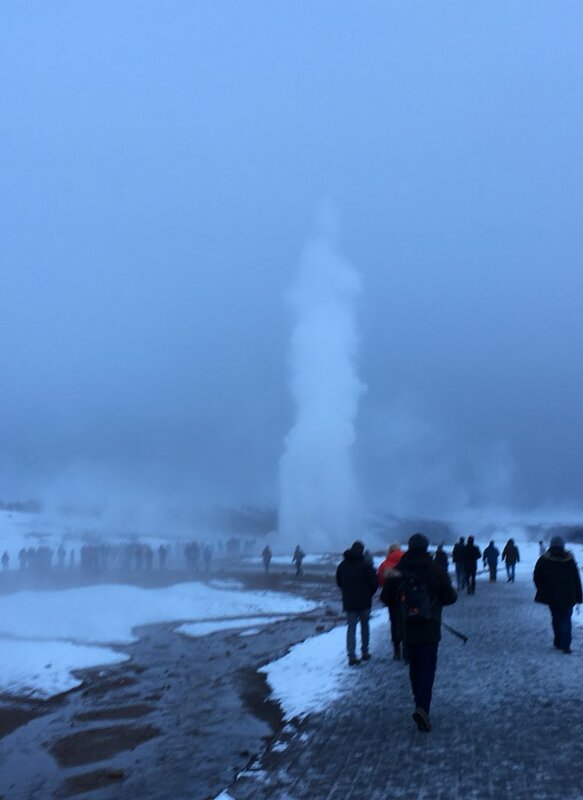 The next stop was the original Icelandic Geysir. This is the original one where we get the word geyser from. Geothermal hot springs contain a large amount of sulfur. This means that all the hot water in the country, including these 95deg (Celsius) and hotter pools and eruptions smelled like rotten eggs, tinting the landscape a yellowish brown. Still it was an amazing natural phenomenon to behold. As the sun set we found our way to a place that specializes in artificial light, an organic green house tomato farm, Friðheimar. 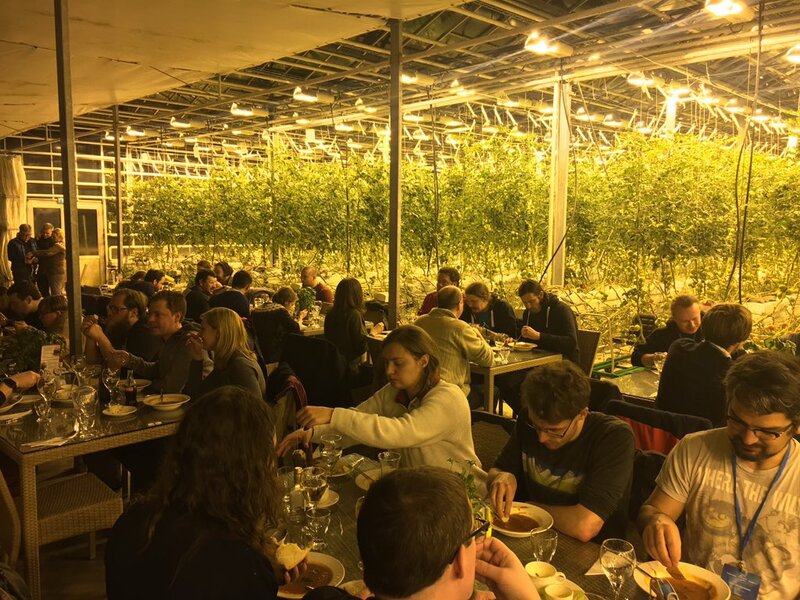 Iceland offers some of the world’s cheapest energy and they were putting it to good use at Friðheimar. One ton of tomato per day are produced in this facility that is in constant sunlight using hydroponics and imported bumblebees. The meal was a fresh tomato soup and if all tomato soup tasted like that I would be eating a lot more of it. It was served with very hearty breads and coffee or tea. I capped my meal off with some tomato ice cream with tomato based toppings. We were scheduled to stay for a much longer time to enjoy the facility and the adjacent horse farm, but again the snow had started and the drivers where concerned with road conditions. Arriving back in the city very late at night made me decide to call it a night and I walked home with the largest snowflakes I maybe have ever seen floating down. Sunday morning I awoke to the record snows and a city infrastructure overwhelmed with the historic accumulation. Having travelled as far as I had and connecting so strongly with my peers, I was determined to make it to the event. Most of the way I was able to walk in the middle of the street in the tire tracks left from the few cars that did manage to stay mobile overnight. The snow ceased as I walked but I kicked up a lot of drift in my trouncing though knee high snow on the not yet shovelled paths of the university campus. It was incredible to be alone with so much snow and the rising sun. Plan D had to be abandoned since the unexpected blizzard made it impossible for most attendees to make it on time. There were a few other plans was told had been attempted and failed so far, so we went with Plan Z. A newly jostled schedule allowed the coffee people some extra time to arrive, a late start time and slightly shorter sessions with no breaks between. It allowed us to get it all packed in. Fortunately, lunch was served by the university cafeteria and the buildings are all connected by underground tunnels. We didn’t even have to put our coats back on to comfortably stroll to lunch. We had Lasagne, salad and what I assume were vegetable protein potato nuggets. Whatever they where, they were delicious with the sweet chili sauce they served. Baddy even played some wonderful accompaniment. Plan Z also included another surprise, an expedition was planned for that night to go to try and see the northern lights. Again paid for by the conference and free to attend by us all. 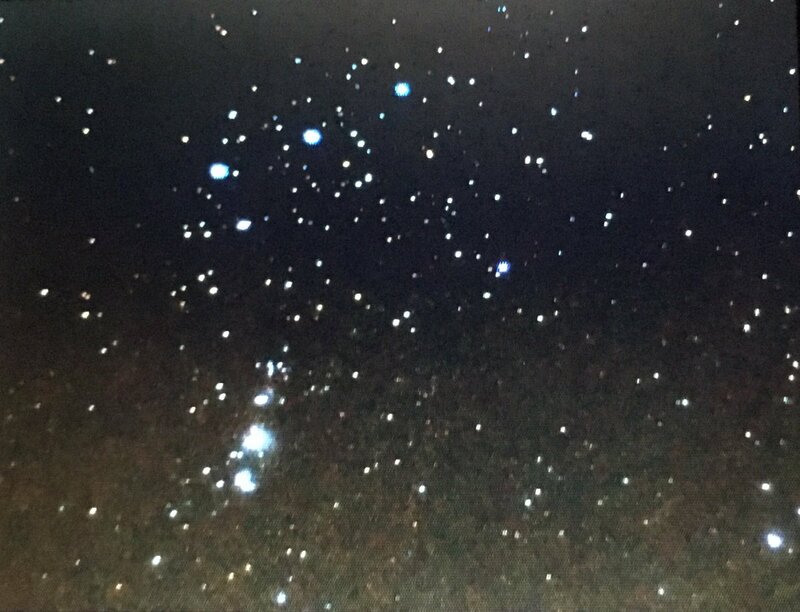 Unfortunately nature did not cooperate with us and we had to return to town and say our goodbyes without having experienced the Aurora Borealis, but the joy of being together and seeing the vividly clear stars in the freezing night sky made the trip worth every second. By happenstance the returning bus route drove directly in front of my hostel and I wasn’t able to say goodbye to everyone in the commotion of departing. It sure was nice not having to walk further in the snow on uneven icy ground as I had done previous nights. The changing plans meant that day one only had 5 total sessions to make room for the tour. 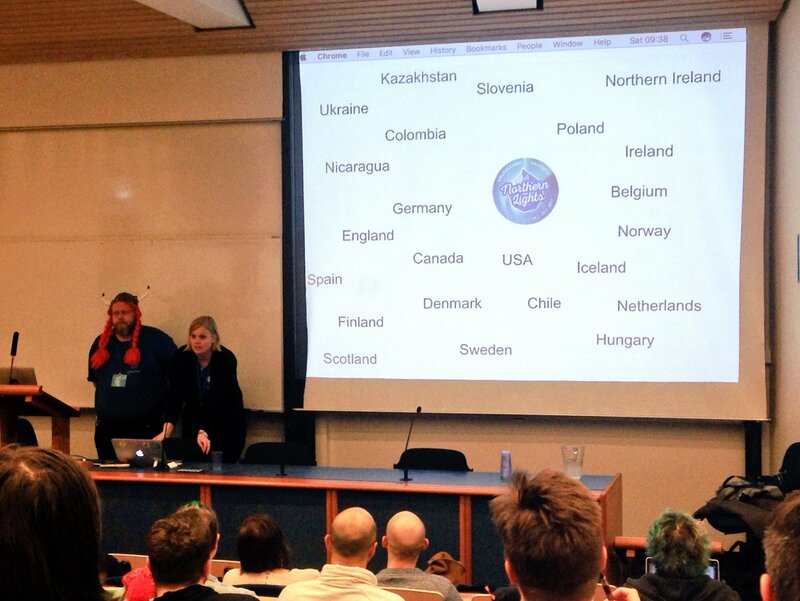 Baddy and Hilmar (perhaps better known as DrupalViking), our 2 camp organizers, kicked things off with a slide showing all the different countries who were represented. This immediately set this camp apart from almost any other event I have ever attended aside from maybe DrupalCon Barcelona. We celebrated our diversity right from the start and it carried through until the last goodbyes. Johanna Bergmann from Amazee gave us a very good insight into how she came into the Drupal space. Not from a development perspective but, like me, from a business one. Her revelation that these agency owners openly shared their trade secrets went against everything she had thought was necessary to maintain a competitive advantage. She soon discovered that this was a real ‘cooperative advantage’ in this community of people that were building the very tool they were basing their businesses on. She said the thing that made this community work was our string ethics, guided by our code of conduct. I have never heard this point articulated better and it really set the tone for the rest of our time together in sessions and in hallway conversations. The theme of cooperation really shone though the next session I saw. Allison Manley delivered a brilliant talk on the kickoff meeting with a client. 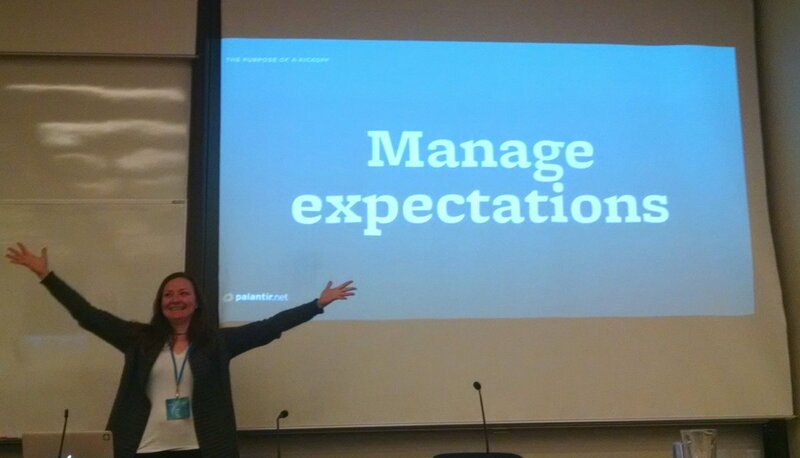 Clear and easy to follow, she laid out the steps they take at Palantir to set expectations and deliver projects. She really focused on how to communicate clearly with multiple stakeholders to be able to get the best results on what are sometimes very complex matters. Some solid takeaways for all folks working on client facing teams. 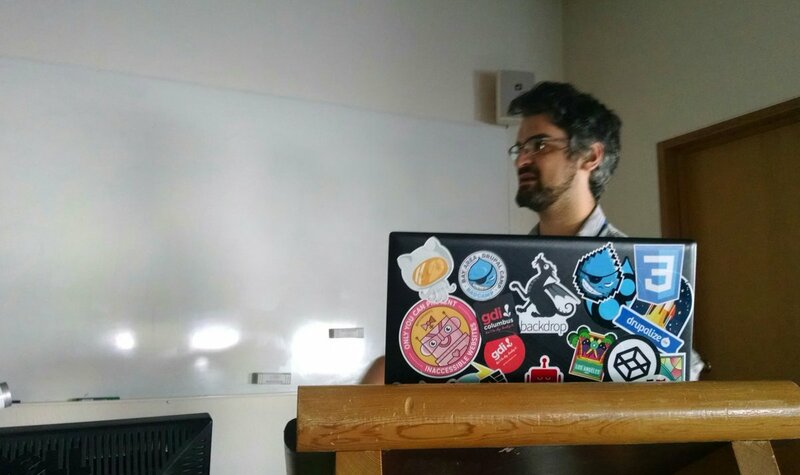 The third session was delivered by Helgi Páll Þórisson, the lead developer at RÚV who had implemented Drupal 6, which had replaced a proprietary and outdated CMS. Rather than just laying out the technical specs of what they had done the presentation really highlighted the journey the team had taken to get to success. We all shared their pain as he recounted that on the initial launch day, with the VP of the network standing behind DrupalViking, they had to try and restart Apache servers and inadvertently taking down everything. But they persisted. And now are one of the largest companies in Iceland to use Drupal. 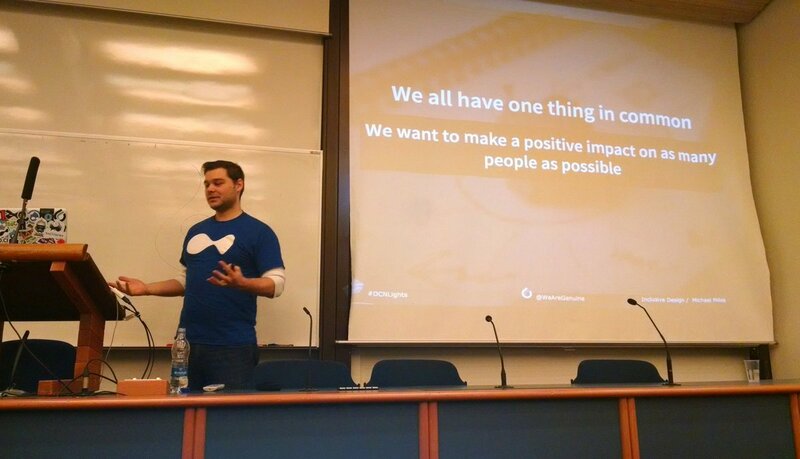 It was a real treat at a DrupalCamp to hear these types of stories from an internal development perspective as opposed to an agency delivery one. Janne Koponen brilliant talk ‘Holistic development and operations environment’ was less about operations and more about ‘The Wunder Process’ was uplifting and invigorating. Starting with the concept of ‘the whole is greater than the sum of it’s parts’ thinking, Wunder believes that small process improvements, no matter how marginal, add up to large improvements. They mirrors Toyota’s continual process improvement mechanisms. He said Toyota gets about a million process improvement suggestions from employees per year and nearly 90% are implemented. The results are a much more efficient overall machine. Focus on the parts of the process and you will get the larger goals you are working towards. My session went over well and I am very proud to say it was the most international crowd to which I have ever spoken. 10 people in the room represented 6 different nationalities and all sorts of backgrounds. Some of my humor fell a little flat I think due to language and poplar culture limitations across borders. It was a good reminder to me that not everyone has seen as much American television as I have. The crowd went along with my requests to actually do some improv exercises at the end. There was a interesting twist that almost no one participating natively spoke the same language though their English was impeccable. Still, we managed to end up with many smiles and new techniques to break the ice for teams and to engage with clients in a fun yet meaningful way. Wes Ruvalcaba talk ‘Virtual Reality on the Web – Introduction and How’ brought us into the world of VR and showed me for the first time, the possibilities of WebVR. While I was nominally familiar with the concept of virtual reality over the internet it wasn’t until this talk that the development side of that work came into focus. He showed us his code for some pretty interesting demos of VR using A-FRAME a Mozilla project with some very straightforward notation. Next time the conversation of ‘what do we do as a CMS after websites’ comes up, I will have some very handy facts to cite. 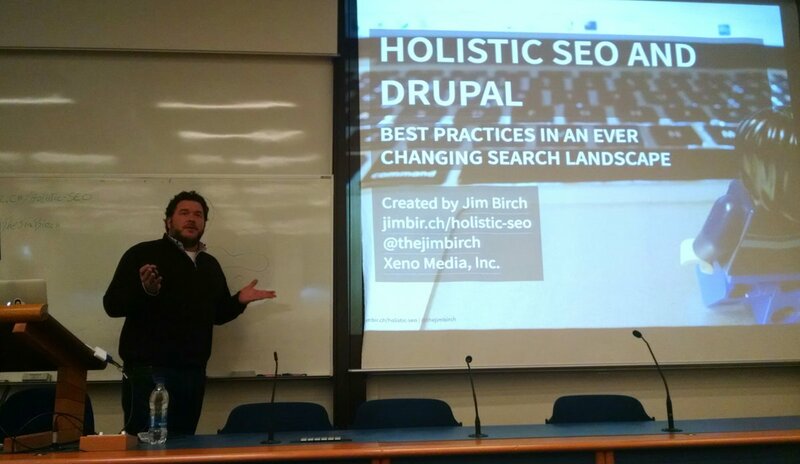 Jim Birch ended the planned sessions on Sunday with Holistic SEO and Drupal, which is about a day and a half long workshop’s worth of SEO tips and tricks delivered in just over 35 minutes. A literal blur of information was delivered and as you can see from his slides, dozens of links were shared that each needs its own exploration and study. Holistic SEO is not something I spend too much of my time thinking on, but I walked away with some realizations and some next steps to improve my own small projects. Baddy and DrupalViking wrapped up the day and we celebrated making this camp happen. They said when they first planned this, in their minds maybe 30 people would attend. In the end 95 people from 25 different countries assembled and bonded over the worst snow in many years, the freezing cold and our renewed sense of purpose that we are in fact creating something bigger than the sum of the parts. Namely Drupal. Currently there is no plan to have a DrupalCamp Northern Lights 2018. It is a good thing that #DCNLights 2017 was enough fun for multiple years!